Part cosplay, part laser tag, and part interactive toy, Disney and Hasbro have teamed up to create a new line of toys and wearable accessories called Playmation that encourages kids to be more active during playtime, instead of just sitting on a couch poking at a touchscreen. The new toys come in response to concerns over kids spending their childhoods just staring at mobile devices instead of running around outside and being active. 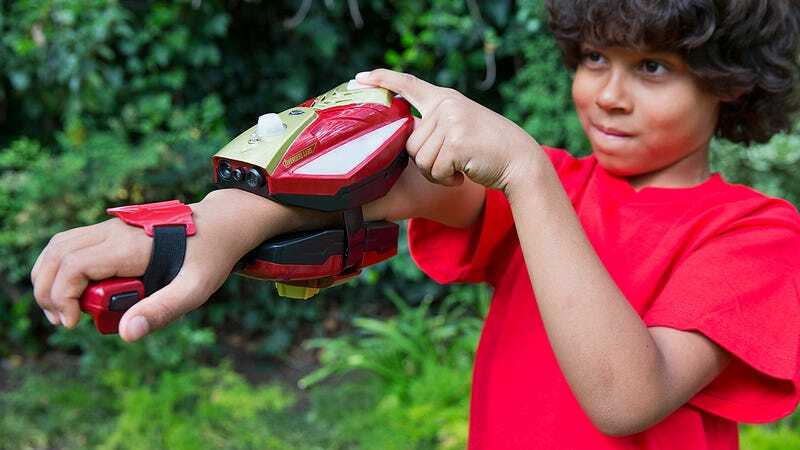 And while Playmation still has kids playing with a new line of action figures, with the addition of the wearable interactive accessories, they also kind of become one. The first Playmation set, available for pre-order starting on July 7 but shipping later in October for $120, will be Avengers-themed and includes a wrist-worn Iron Man Repulsor, Captain America and Red Skull figures, and a pair of Power Activator stands that help bring those tiny characters to life. The Repulsors are able to wirelessly communicate with the Power Activators, other wearable Playmation accessories, and with the kids (or adults) who are wearing them through the voice of JARVIS, Tony Stark’s artificially intelligent assistant. They’re encouraged to play out imaginary missions in real life as they’re instructed to run, jump, duck, dodge, or other physical actions that are presumably detected by the Repulsor. And while kids are able to team up and play together to complete a mission, the Repulsors can also be used like a pair of laser tag blasters to face off against an opponent. The Playmation toys can also be connected to a free accompanying AvengersNet app to unlock additional make-believe locations and characters, or to download new missions to play out. However, the toys do not require a constant connection to a Wi-Fi network to work. So kids can use them whether they’re playing in their basement at home, or at the park many blocks away.